There are a number of fun vanity items in the game that you can’t actually get in the game, and I often see questions about how you get them. The World of Warcraft Trading Card Game is published by Upper Deck Entertainment, in collaboration with Blizzard. It’s a fairly typical collectible/trading card game, with cards of varying rarity purchased in small assorted randomised packs. The game itself isn’t bad, although I haven’t had as much chance to play it as I’d like. What sets the WoW TCG apart from other trading card games such as Magic: the Gathering is that it has lots of concrete tie-ins with WoW itself, allowing you to get in-game WoW items by acquiring cards in the card game. UDE Points: Every booster pack of 15 cards also contains a “UDE Points card”, usually worth 100 UDE points (although some rare examples have much higher values). Each UDE points card has a unique code on it that you enter online to add the card’s points value to your account; you can spend the UDE Points at UDE’s online store for a variety of items, including in-game items. Loot Cards: In each expansion set of the game there are three cards which have a special, much rarer, “loot” variant. The loot cards have scratch-off panels hiding a redemption code; entering the code online will net you the in-game item specific to that loot card. UDE Point Card codes are entered at UDE’s site, which functions like an online store. Once you have enough points for the item you want, you place an order, and the store software gives you a code. See step 2. Unless you are interested in the trading card game anyway, or have a lot of money to spend on a card game you’re not going to actually play, the best place to get the loot cards is from eBay. 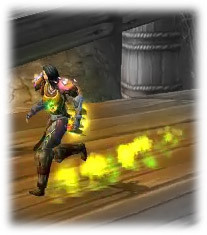 This site tracks eBay.com auctions for WoW TCG loot cards, showing you historical price trends and items currently available on eBay. I haven’t used it myself, but it looks like a good service. Once you have the loot card, scratch off the panel to reveal the hidden code. See step 2. So, what can one get, in-game? Let’s take a look! 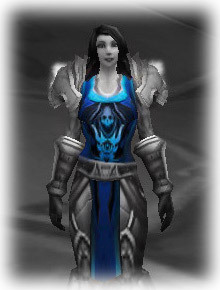 Tabard of Frost – see right. 2,000 points. Carved Ogre Idol – turns you into an Ogre, very snazzy. 25,000 points. Perpetual Purple Firework – shoots purple fireworks. 3,000 points. Tabard of Brilliance – new in 2.4.3. Tabard of Fury – new in 2.4.3. Tabard of Nature – new in 2.4.3. Tabard of the Arcane – new in 2.4.3. Tabard of the Defender – new in 2.4.3. Tabard of the Void – new in 2.4.3. 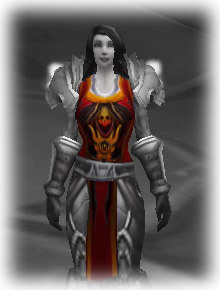 Tabard of Flame – see right. Card: Landro Longshot. Hippogryph Hatchling – gives you a baby Hippogryph non-combat pet. Card: Thunderhead Hippogryph. Riding Turtle – a riding turtle mount that doesn’t give you any speed boost. Card: Saltwater Snapjaw. Picnic Basket – sets up a picnic grill lootable for food, and an umbrella. Card: Rest and Relaxation. Banana Charm – gives you a monkey non-combat pet. Card: King Mukla. Imp in a Ball – an imp, in a ball! Like the sign says! Card: Fortune Telling. Goblin Gumbo Kettle – sets up a kettle of Goblin Gumbo lootable for food. Card: Goblin Gumbo. Fishing Chair – sets up a chair and umbrella to fish from. Card: Gone Fishin’. 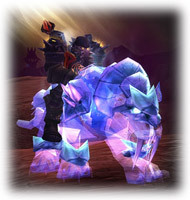 Reins of the Swift Spectral Tiger and Reins of the Spectral Tiger – see right. A very cool translucent tiger mount; the same card lets you get both epic (Riding: 150) and non-epic (Riding: 75) versions. This card is tremendously valuable, and regularly eBays for four figures. Card: Spectral Tiger. Paper Flying Machine Kit – creates a Paper Flying Machine, which will stack to 5 in your bags and can be thrown to others like a Heavy Leather Ball. Card: Paper Airplane. Rocket Chicken – gives you a mechanical chicken pet, complete with rocket boosters. Card: Robotic Homing Chicken. Dragon Kite – gives you a Chinese-style dragon kite on a string (effectively a non-combat pet). Card: Kiting. Papa Hummel’s Old-Fashioned Pet Biscuit – creates a stack of consumables, used to make a non-combat pet double in size. Card: Papa Hummel’s Old-Fashioned Pet Biscuit. Goblin Weather Machine – Prototype 01-B – creates little ambient weather effects around your character. Card: Personal Weather Maker. X-51 Nether-Rocket X-TREME and X-51 Nether-Rocket. A flying mount in epic (Riding: 300) and non-epic (Riding: 225) versions from the same card. Looks much like the rocket that’s WoWHead’s logo, in fact. Card: X-51 Nether-Rocket. Path of Illidan – see right. Gives you a buff that leaves green fel-fire in your wake. Card: The Footsteps of Illidan. D.I.S.C.O. – places a disco ball (complete with sparkling reflections) on the ground. Card: Disco Inferno!. Soul-Trader Beacon – summons an Ethereal Soul-Trader “pet”, an Ethereal NPC who follows you around and absorbs energy from kills you make while he’s in the vicinity; you can then use this energy to buy items from him. These include a set of cloth armor meant to look like the Ethereals’ armor, and various consumables with fun non-combat effects. Previous PostAhune = Too HardNext PostDiablo 3 it is, then. Gah gotta hate blizzard for putting such brillant items as a cash reward least there is nothing game-breaking i suppose. But come on half of these things could have been for engineering which needs some new gimmicks after patch 2.01 basically wiped out all the old good ones. I agree that engineering needs some love, though; post-300 the magic just seems to be gone.